Supplementary video of the in-plane technique from lateral to medial (right side). Abstract: The anterior cutaneous branches of the thoracolumbar spinal nerves enter the rectus sheath at its lateral border and perforate the muscle after travelling a short distance in the ventral direction. In this anatomical case series, we show that dye injection at the medial margin did not lead to reliable impregnation of the target nerves. The local anesthetic should therefore be injected at the lateral edge of the rectus sheath. Preceding surgical procedures to the ventral abdominal wall may affect the craniocaudal spread of local anesthetic. The skin of the abdominal wall is innervated by the segments Th7 to L2, medially by the mammillary line through the anterior cutaneous branches and laterally by the mammillary line through the lateral cutaneous branches of the associated spinal nerves.1 These are mixed nerves, which also innervate the muscles of the abdominal wall. Figure 1 Transducer position, course of the anterior cutaneous branches (yellow) and instillation of local anesthetic (red). The rectus abdominis muscle is innervated by the segments Th7 to Th12 (Th5 to L1). At the lateral edge of the rectus sheath, the anterior cutaneous branches divide into superficial (innervation of the skin) and deep branches, which enter laterally into the rectus sheath. From that point, they travel a short distance behind the rectus abdominis muscle before perforating ventrally and reaching the innervation area of the anterior abdominal wall. Within the rectus sheath, they give off branches to the posterior aspect of the rectus sheath and to the rectus abdominis muscle (Video S1: right side). This muscle is subdivided ventrally by tendinous intersections into several (usually three to four) segments.1 Therefore, local anesthetic must be applied posteriorly to the rectus abdominis muscle and ventrally to a clearly visible double layer in order to achieve a sufficient craniocaudal spread. This double layer consists of the aponeuroses of the transversus and the internal oblique abdominis muscles (Figure 1). The investigations were performed at the Institute of Anatomy, University of Rostock, Germany. 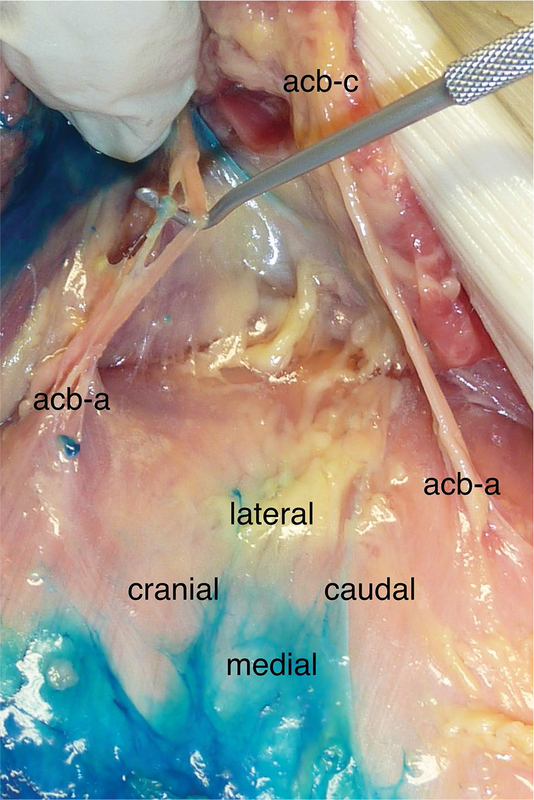 Six ultrasound-guided rectus sheath blocks were performed on three unfixed donor cadavers, which had been designated for education or research, using 20 mL of Alcian blue. The linear transducer (38 mm, 6–13 MHz from Sonosite, Bothell, WA, USA) was placed in the transverse plane between the xiphoid and the umbilicus above the rectus abdominis muscle (Figure 1). The injections were performed using an in-plane technique either at the medial (in lateral direction) or at the lateral (in medial direction) edge of the rectus abdominis muscle with a SonoPlex® 21G×100 mm cannula from Pajunk, Geisingen, Germany.The ultrasound-optimized needle was placed between the rectus abdominis muscle and the posterior leaf (double layer) of the rectus sheath (Video S2: right side, injection from lateral to medial). This research was exempt from review by an ethics committee, because it did not include studies on living humans or animals. The results are summarized in Table 1. Injections at the lateral edge of the rectus sheath (first cadaver, right side [1R], second cadaver, right side [2R], third cadaver, left side [3L]) generally resulted in complete impregnation of the target nerves (Figure 2). An exception to this was observed with preparation 3R. In this case, the rectus abdominis muscle had lipomatous degeneration (as a result of partial denervation) following a conventional cholecystectomy and was adhered to the posterior leaf of the rectus sheath. Therefore, the spread of the dye was restricted in the cranial direction (Figure 3). Injections from medial to lateral did not result in the staining of the target nerves in both cases (1L and 2L) (Figure 4). Notes: aIn cranial direction. bCondition after conventional cholecystectomy. Numbers 1–3 refer to cadavers 1–3. Abbreviations: L, left side; R, right side. Figure 2 Anterior cutaneous branches (acb) impregnated by the dye (injection from lateral). Notes: View from medial below the lateral edge of the rectus abdominis muscle. Preparation: first cadaver, right side (1R). Abbreviations: acb-a, penetrating the posterior leaf of the rectus sheath; acb-b, giving off a branch to the posterior rectus sheath; acb-c, penetrating the rectus abdomins muscle. Figure 3 Lipomatous degeneration of the rectus abdominis muscle (“RA”) and restricted spread of the injectant in the cranial direction. Notes: View from medial below the lateral edge of the rectus abdominis muscle. Preparation: third cadaver, right side (3R). Abbreviation: acb, anterior cutaneous branch. Figure 4 Anterior cutaneous branches (acb) without staining (injection from medial). Notes: View from medial below the lateral edge of the rectus abdominis muscle. Preparation: first cadaver, left side (1L). Abbreviations: acb-a, penetrating the posterior leaf of the rectus sheath; acb-c, penetrating the rectus abdominis muscle. 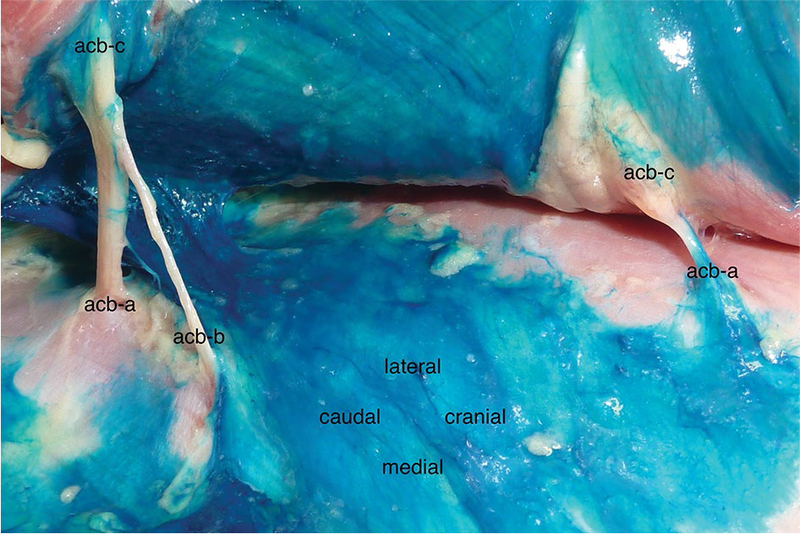 The choice of regional anesthesia technique for abdominal surgery is influenced by many factors. Previous operations on the abdominal wall, even outside of the rectus sheath, may compromise the spread of injected local anesthetic. In this situation, alternative procedures should be considered. 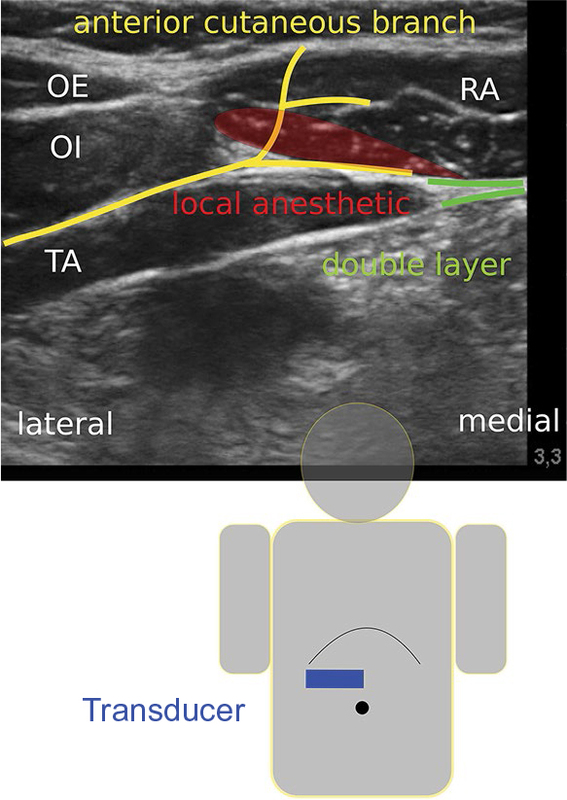 For ultrasound-guided rectus sheath blocks, the local anesthetic should be injected at the lateral edge of the rectus sheath, usually at the level of the surgical incision (due to the possibility of restricted craniocaudal spread). A lateral approach avoids the accidental puncture of the epigastric artery. The Helios Research Centre provided financial support for the work. Loeweneck H, Feifel G. In: Lanz T von, Wachsmuth W, editors. Praktische Anatomie [Practical Anatomy]. Ein Lehr- und Hilfsbuch der anatomischen Grundlagen ärztlichen Handelns. Berlin: Springer-Verlag; 2004:33–57. German. Rozen WM, Tran TM, Ashton MW, Barrington MJ, Ivanusic JJ, Taylor GI. 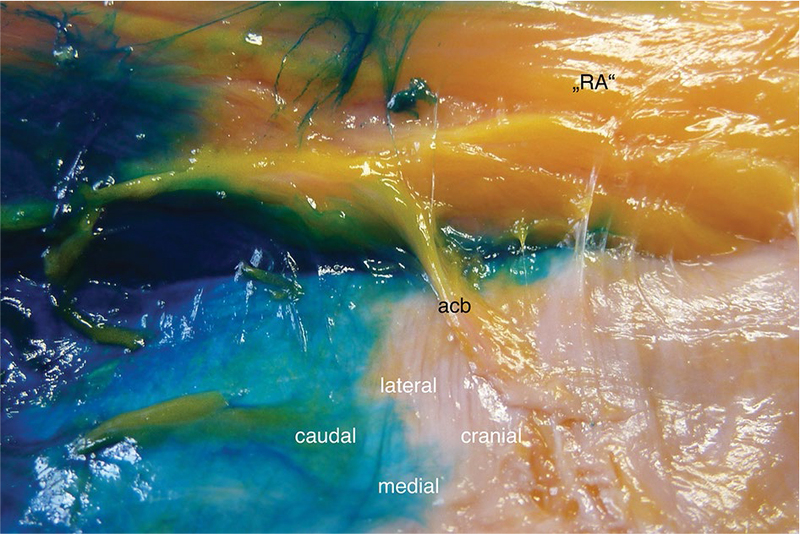 Refining the course of the thoracolumbar nerves: a new understanding of the innervation of the anterior abdominal wall. Clin Anat. 2008;21(4):325–333. de Jose Maria B, Götzens V, Mabrok M. Ultrasound-guided umbilical nerve block in children: a brief description of a new approach. Paediatr Anaesth. 2007;17(1):44–50. Willschke H, Kettner S. Pediatric regional anesthesia: abdominal wall blocks. Paediatr Anaesth. 2012;22(1):88–92. Dingeman RS, Barus LM, Chung HK, et al. Ultrasonography-guided bilateral rectus sheath block vs local anesthetic infiltration after pediatric umbilical hernia repair: a prospective randomized clinical trial. JAMA Surg. 2013;148(8):707–713. Gurnaney HG, Maxwell LG, Kraemer FW, Goebel T, Nance ML, Ganesh A. Prospective randomized observer-blinded study comparing the analgesic efficacy of ultrasound-guided rectus sheath block and local anaesthetic infiltration for umbilical hernia repair. Br J Anaesth. 2011;107(5):790–795. Litz CN, Farach SM, Fernandez AM, et al. Percutaneous ultrasound-guided vs. intraoperative rectus sheath block for pediatric umbilical hernia repair: a randomized clinical trial. J Pediatr Surg. In press 2017. Landmann A, Visoiu M, Malek MM. Development of a novel technique for bilateral rectus sheath nerve blocks under laparoscopic-guidance. J Pediatr Surg. In press 2017. Manassero A, Bossolasco M, Meineri M, Ugues S, Liarou C, Bertolaccini L. Spread patterns and effectiveness for surgery after ultrasound-guided rectus sheath block in adult day-case patients scheduled for umbilical hernia repair. J Anaesthesiol Clin Pharmacol. 2015;31(3):349–353. Webster K. Ultrasound-guided rectus sheath block - analgesia for abdominal surgery. Update in Anaesthesia. 2010;26:12–17. Abrahams M, Derby R, Horn JL. Update on ultrasound for truncal blocks: a review of the evidence. Reg Anesth Pain Med. 2016;41(2):275–288. Shido A, Imamachi N, Doi K, Sakura S, Saito Y. Continuous local anesthetic infusion through ultrasound-guided rectus sheath catheters. Can J Anaesth. 2010;57(11):1046–1047. Tsui BC, Green JS, Ip VH. Ultrasound-guided rectus sheath catheter placement. Anaesthesia. 2014;69(10):1174–1175. Hutchins JL, Kesha R, Blanco F, Dunn T, Hochhalter R. Ultrasound-guided subcostal transversus abdominis plane blocks with liposomal bupivacaine vs. non-liposomal bupivacaine for postoperative pain control after laparoscopic hand-assisted donor nephrectomy: a prospective randomized observer-blinded study. Anaesthesia. 2016;71(8):930–937. Ammar AS, Mahmoud KM. Effect of adding dexamethasone to bupivacaine on transversus abdominis plane blocks for abdominal hysterectomy: a prospective randomized controlled trial. Saudi J Anaesth. 2012;6(3):229–233. Ding W, Li W, Zeng X, et al. Effect of adding dexmedetomidine to ropivacaine on ultrasound-guided dual transversus abdominis plane block after gastrectomy. J Gastrointest Surg. In press 2017. Huang SH, Lu J, Gan HY, Li Y, Peng YG, Wang SK. Perineural dexamethasone does not enhance the analgetic efficacy of ultrasound-guided subcostal transversus abdominis plane block during laparoscopic cholecystectomy. Hepatobiliary Pancreat Dis Int. 2016;15(5):540–545. Hamada T, Tsuchiya M, Mizutani K, et al. Levobupivacaine-dextran mixture for transversus abdominis plane block and rectus sheath block in patients undergoing laparoscopic colectomy: a randomized controlled trial. Anaesthesia. 2016;71(4):411–416. Courreges P, Poddevin F, Lecoutre D. Para-umbilical block: a new concept for regional anaesthesia in children. Paediatr Anaesth. 1997;7(3):211–214. Torii N, Tachibana K, Iwasaki M, Takeuchi M, Kinouchi K. Ultrasound-guided rectus sheath block vs. transversus abdominis plane block in children undergoing umbilical hernia repair. Masui. 2016;65(6):560–565. Børglum J, Gögenür I, Bendtsen TF. Abdominal wall blocks in adults. Curr Opin Anaesthesiol. 2016;29(5):638–643. El-Boghdadly K, Madjdpour C, Chin KJ. Thoracic paravertebral blocks in abdominal surgery – a systematic review of randomized controlled trials. Br J Anaesth. 2016;117(3):297–308. Hebbard PD. 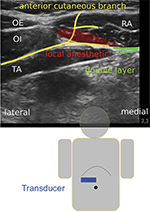 Transversalis fascia plane block, a novel ultrasound-guided abdominal wall nerve block. Can J Anaesth. 2009;56(8):618–620. Hebbard PD, Barrington MJ, Vasey C. Ultrasound-guided continuous oblique subcostal transversus abdominis plane blockade: description of anatomy and clinical technique. Reg Anesth Pain Med. 2010;35(5):436–441. Weibel S, Jokinen J, Pace NL, et al. Efficacy and safety of intravenous lidocaine for postoperative analgesia and recovery after surgery: a systematic review with trial sequential analysis. Br J Anaesth. 2016;116(6):770–783. Chin KJ, Adhikary S, Sarwani N, Forero M. The analgesic efficacy of pre-operative bilateral erector spinae plane (ESP) blocks in patients having ventral hernia repair. Anaesthesia. 2017;72(4):452–460. Dam M, Moriggl B, Hansen CK, Hoermann R, Bendtsen TF, Børglum J. The pathway of injectate spread with the transmuscular quadratus lumborum block: a cadaver study. Anesth Analg. In press 2017.